Abu Dhabi: The UAE has played in a key role in supporting global and regional demining efforts, as well as in reducing the social and economic effects of mines. Coinciding with the International Day for Mine Awareness on April 4, a report is highlighting the key demining initiatives organised by the UAE in various countries, as well as its efforts to help local people resume their normal lives. The 2019 theme is “United Nations Promotes SDGs: Safe Ground — Safe Home”. The UAE has created a plan, in cooperation with the UN office in Aden, to clear mines in the liberated areas of Hodeida. Emirati engineering teams have removed many thousands of mines and deactivated them. 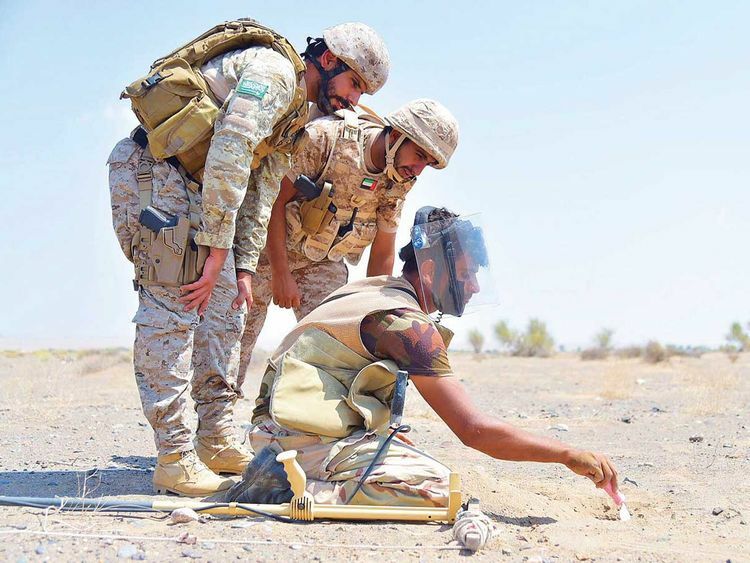 The UAE is keen to exchange its demining expertise with Yemeni personnel and has held many relevant workshops to train Yemeni volunteers on the Red Sea Coast. The UAE has also helped to raise awareness about this issue, and a field engineering team from the UAE Armed Forces conducted awareness campaigns for the residents of Yemen’s liberated areas about the dangers of mines and explosives. Andrea Recchia, Head of Sub-Office of United Nations Office for the Coordination of Humanitarian Affairs in Yemen, praised the UAE’s efforts in rescuing Yemeni citizens in Hodeida Governorate, as well as its role in clearing mines in the liberated areas of the Red Sea Coast, which saved the lives of civilians. The UN official also lauded the UAE’s humanitarian initiatives in Yemen, which reflect its keenness to support and protect Yemenis, in line with the UN’s plans to provide the residents of the country’s liberated areas with decent lives, especially those affected by mines and improvised explosive devices (IEDs). In Lebanon, the UAE launched a project, titled, “Demining and Cluster Bomb Removal from the South,” which took place from 2006 to 2009, at a cost of $50 million (Dh183.5 million). The project included the clearing of over 3 million square metres of land and over 26 thousand anti-personnel mines, while 176 minefields were cleared for local people.